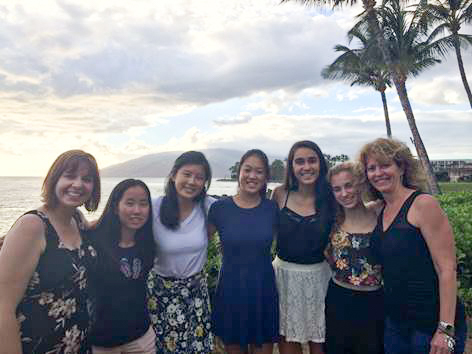 Over the summer, seven Harker journalism students – chaperoned by journalism teacher Ellen Austin and librarian Lauri Vaughan – ventured to the Hawaiian island of Maui to bolster their skill sets in preparation for the 2014-15 school year. “The goal of the trip was to realize what we needed to improve upon and learn the steps to take in order to get where we wanted to be,” said journalism student Jacqui Villarreal, grade 12. During the trip, the yearbook staff had the honor of working with Laura Parker and Tina Cleavelin of Jostens, the company that prints the yearbook. “Not only did they open our eyes about what we could do differently, they also created fun for us to have after a six-hour work session,” Villarreal recalled. Villarreal said the trip inspired them to change the design principles and work flow in the journalism department.